Every season it’s the same, your kid’s ski boots that fit with wiggle room last winter are now too small. Mom might want at new ski outfit – but when the kids need new gear every year – mom is relegated to her old parka once again. Before you go buying new skis for your kids, remember the ski boot is the most important piece of ski equipment. Imagine a child’s ski boot that grows with your weed-like child. I thought this sounded too good to be true. An expandable boot? Old school parents, myself included, accomplished this with extra socks, and boots that were too big at Christmas then toe-crunching come March. 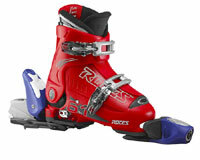 But Italian ski boot and skate producer Roces has developed the first adjustable ski boot for kids. Parents can purchase, for about $99 on overstock.com, a ski boot that grows from toddler size 9-12, 13-3 or youth size 4-7. It’s called the IDEA and it may be a good one for fast growing families. The IDEA ski boot has a lever on the heel that allows the boot shell to expand, the accordion-style liner adapts within, and comes in 3 size ranges (each model adjusts 6 sizes) and a range of colors: white, pink, red and black. Note to parents: if you plan to “hand me down” these adjustable boots – pick a color pleasing to all your kids. These growing ski boots may sound gimmicky. But they have been tested to be technically efficient and safe according to the 56-year old company Roces. Families are only one target market for this ingenuity, the IDEA boots were also designed with ski rental shops in mind to reduce inventory while satisfying many size demands. Many ski shops offers Kids Ski Gear Trade-In Programs for approximately $200 the first year for the initial equipment purchase. You can then trade in your kid’s gear for 50% value the next season, so you apply the $100 trade credit and pay another $100 for each consecutive year. So five years of equipment costs $600, and your child is properly fitted each season. At the end of the program you own the gear to hand down or trade in. Read more on Kids Ski Gear and How to Pack for your Family Ski Trip and our Best Adult Skis Review.